Nike is discounting its selection of Apple Watch Nike+ watches by 30 percent, dropping prices by a significant amount. For the 38mm Apple Watch Nike+, the discount drops the price from $369 to $258.97, while on the 42mm model, the discount drops the price from $399 to $279.97. The discount applies to the 38mm Apple Watch in Silver/White and Black/Cool Grey. For 42mm models, the discount is available on the Silver/White and Black/Silver configurations. The 42mm White/Platinum and Black/Volt are not included in the sale. It's not clear how long the sale will last nor how long the discounted Nike+ Apple Watch models will remain in stock, so if you're interested in purchasing one, you should do so sooner rather than later. At 30 percent off, the discount is one of the best that we've seen on the Apple Watch Nike+ in recent months. Nike's current sale follows an exclusive 30 percent discount that was offered to Nike+ Run Club members over the weekend. 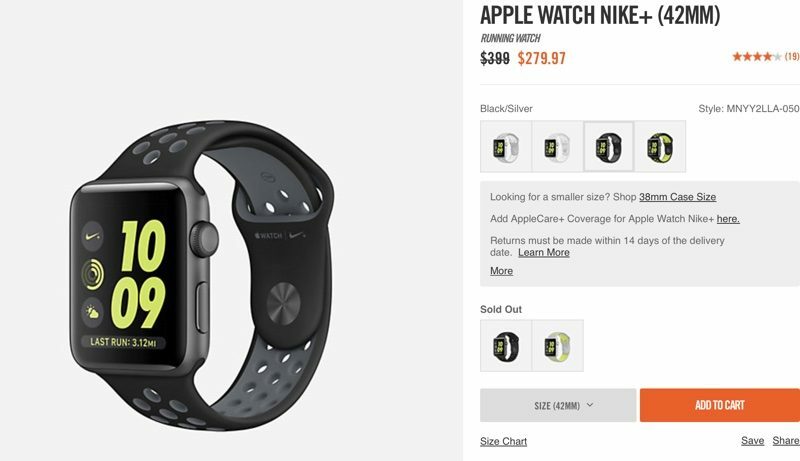 While Nike+ Apple Watch models are on sale, no Nike+ bands have been discounted. Gotta empty pipeline ahead of AW3 announcement (leaks). [doublepost=1502308436][/doublepost]How well are the aluminum cases holding up? The limited edition colors (blues and purples) in June sold out really fast. Now that the (normal color) Nike bands are available separately, I suspect most who are buying the Apple/Nike Watch (vs. non-Nike models) are doing it more to get the extra faces/app than for the perforated bands. This seems a strong indication of reducing inventory ahead of a Series 3 Apple/Nike Watch (third-parties are often less circumspect than Apple about clearing inventory ahead of revisions). And do you mean the Aluminum Apple Watches? My first-day (non-Nike) Series 0 ("Space Gray Sport") looks pristine, though I suspect under a microscope you'd find some scratches in its Space Gray anodizing. And it's currently sporting a "Violet Dust" Nike band. OK, it looks like that's a %10 ($28) cash back that goes into your Ebates "wallet". I guess if you're easily able to apply it to another purchase, it's more or less like a direct additional discount. You buy it through the link, and then every 3 months your accumulated CB (real $$$) is deposited into your paypal account. I wonder if the Series 2 will get the new CPU of the Series 3 like they did last year. I doubt it. Also if the LTE rumors are true, Series 3 42mm will start at a minimum of $399. They were all gone 3-minutes after this thread was posted. Indication Apple Watch 3 update could be a REALLY big deal? Only two color combos are sold out in that picture. The other 4 color combos would appear to still be in stock. Much like you, yesterday i came so close to picking one up because the price point was amazing. I said to myself, if i change my mind, just return it. Screwed around and didnt order it, checked this morning and i was mad at myself because they were out of stock lol. Are these in any way different to the normal apple ones? As in are you sacrificing anything by buying this instead of theirs? Or is it just that you get the extra Nike stuff like the watch face on top ? No disadvantages. Only advantage is the otherwise unavailable bands (the holes I guess are better for evaporating sweat) and I guess also the additional Nike faces. This is a fantastic discount. Yes, Series 3 is right around the corner but for me, Series 2 does everything I need. I don't need LTE or a camera, although if battery is improved that could be something nice. Perhaps this will be the standard price for Series 2 once Series 3 launches and Nike know that. Still, decent if you were in the market for one anyway (though I think anyone who wants one should just wait until the next versions now myself). I love my Series 2.